Newly crowned Victorian Production Sedan Champion, Beau Riley, will be looking to add another number one to the side of his car this weekend, when he competes in the National Production Sedan Title, at the Western Speedway, Hamilton. Riley, from the Coalfields town of Collie, in the South West of Western Australia, headed to Bairnsdale a fortnight ago, to contest the Victorian Title, making a final lap pass on National Champion Trevor Mills, to record the biggest win of his career. Riley, previously had finished on the podium of the 2017 WA State Title, where he placed third. 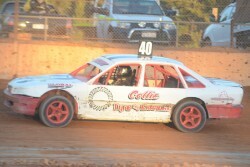 This season, Riley has been unbeatable at the Make Smoking History, Collie Speedway, winning on four occasions, with Bairnsdale being his fifth win of the season. Winning any title at all is a huge achievement let alone leaving it until the last lap, but that feeling when I crossed that line was unexplainable, years of hard work in the making, Riley said. I was not real confident going into the event due to never have raced there before, wrong ratio, set up etc so I assumed the Victorians would have the edge over me. When I caught up to Mills before the yellows came on I thought to myself, I am a fair chance here, he added. Riley is full of admiration for the National Champion, with the pair putting on a classic finish at Bairnsdale. I think apart from Mills who I regard as the best Production Sedan driver in Australia at the moment anyone is capable of winning this Title. A lot of it comes down to luck. All you have to do is make the A main and anything can happen, Riley adds. Riley has spent the last ten days relaxing, with little maintenance on the car, hitting the caravan parks along the Victorian coast, including the Mornington Peninsula and the Great Ocean Road. Rileys partner Felicity also has an ambition of eating a pie from every bakery in Australia, which may have slowed the trip down somewhat. Beau Riley is one of seven West Australians in the field of forty four, and can not wait for the National Title to commence this Friday with official practice. Speedway Sedans Australia, will as always, provide full and comprehensive coverage of the event, including updates from Scrutineering and Practice, full results of Practice on the Facebook Page and Website along with Live Audio. Race Monitor will also be in operation across the course of the weekend. Speedway Sedans Live will be available on both nights of racing, with the streaming service, live, exclusive and free on our Facebook page. All results and stories will also be found on the Speedway Sedans Australia website and facebook pages across the weekend. Nominations in roof number order.